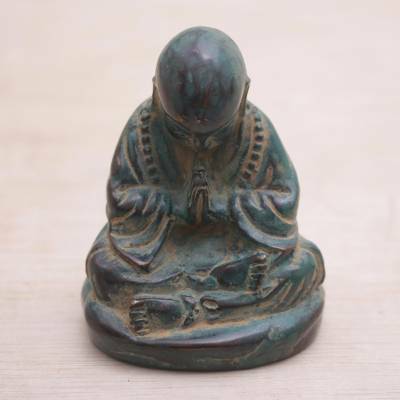 Handcrafted Balinese Bronze Meditating Buddha Figurine, "Buddha's Enlightenment"
Add a peaceful accent to your home decor with wonderfully calming figurine from Adi Noviantara. Sitting in a single lotus position with beads around his neck, Buddha bows his head in deep meditation, hands pressed tightly together. An attractive distressed finish completes the lovely figurine. "This is such a peaceful piece." This is a wonderful piece. What makes this special from the artist is his head is bowed down and his hands are tightly clasped. A great addition to my collections of Buddha .